In 2016, Ducati’s 959 Panigale is to become a larger capacity, even more versatile “Supermid” model. The Ducati 959 Panigale shares the same innovative stylistic features that characterise its ‘bigger brother’, the 1299 Panigale – but with an engine designed for a more enjoyable everyday riding experience and more thrills on the race track. The new 955 cm3 twin-cylinder power unit, the first Superquadro to have obtained Euro 4* type-approval, comes with a new stroke length and other innovations that have given rise to an even more impressive torque curve and increased maximum power, now 157 hp at 10.500 rpm. The increased torque and maximum power values do not imply shorter service intervals, therefore, valve clearance inspections are still only required every 24,000 kilometres (15,000 miles). The super-smooth engine continues to be a fully stressed member of the innovative monocoque frame, achieving both an outstanding power-to-weight ratio and ride-enhancing response and agility with a dry weight of only 176 kg* – while still ensuring full compliance with the structural limitations required by Euro 4* standards. 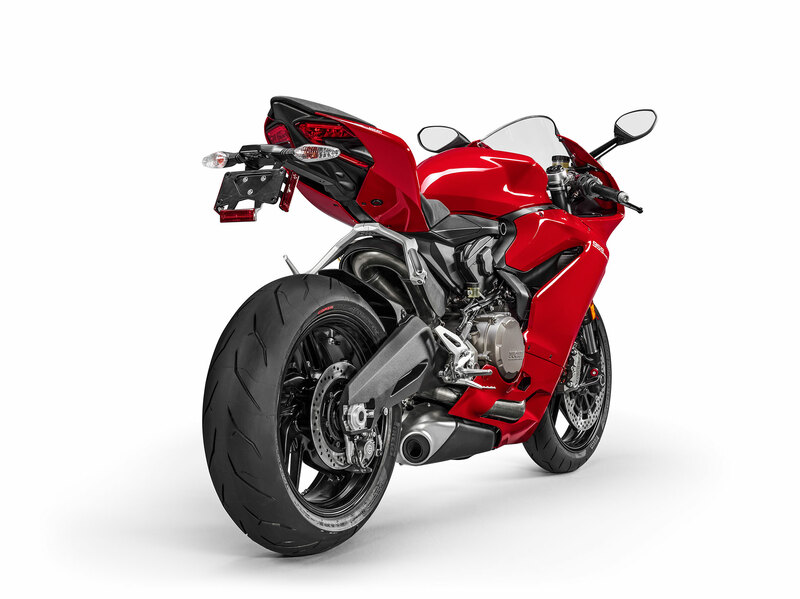 The unmistakable 1299 Panigale-derived silhouette of this bike, even with a redesigned nose fairing, headlight and tailpiece, underlines the family DNA: the Ducati Quick Shift (DQS), Riding Mode technology including Ride-by-Wire, triple-stage Bosch ABS, Ducati Traction Control (DTC) and Engine Brake Control (EBC) featured by the Panigale are in line with Ducati’s very own standards of technological excellence. Every last detail of the 959 Panigale pays tribute to Ducati’s legendary racing heritage. The wider nose fairing and screen improve aerodynamic performance and add to the aggressive look of the new front end, also enhanced by larger-section front air intakes. The split tailpiece design is the final touch to a real work of art: the 959 Panigale fairing, now including redesigned lateral air intakes and new rear view mirrors. The new bike is also equipped with aluminium billet-machined footrests for enhanced boot grip while riding. The technology and performance of the new 959 Panigale match the levels of models with large engines, and combine with greater versatility for use in all conditions, from the city to the track. The new 955 cc twin-cylinder, the first Euro 4 homologated Superquadro, boasts a new stroke value and many other interventions that have led to a higher torque curve and greater maximum power. The 959 Panigale is available in traditional Ducati red with black wheels or a stunning Arctic White Silk with contrasting red wheels. 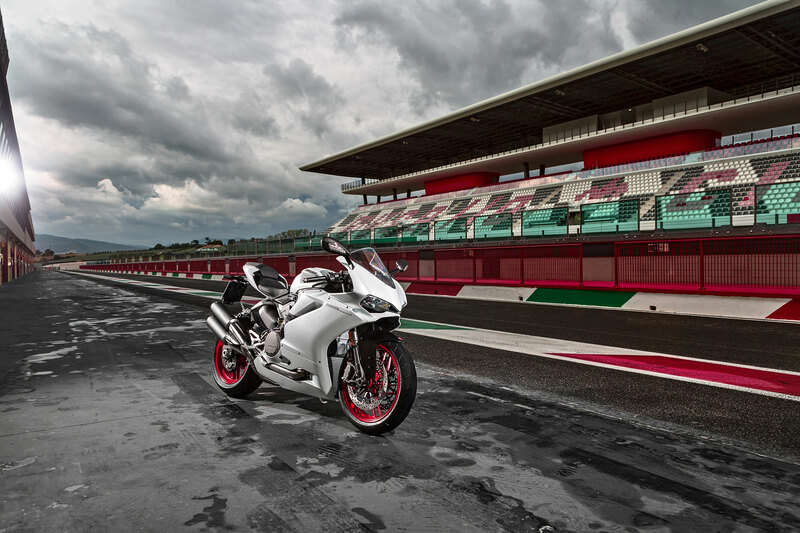 2016 will welcome a new addition to the Ducati Superbike family: the “Supermid” 959 Panigale. The Ducati 959 Panigale shares the same innovative stylistic features that characterise its ‘bigger brother’, the 1299 Panigale – but with an engine designed for a more enjoyable everyday riding experience and more thrills on the race track. The new 955 cm3 twin-cylinder engine, the first Superquadro to have obtained Euro 4 type-approval, comes with a new stroke length and other innovations that have given rise to an even more impressive torque curve. 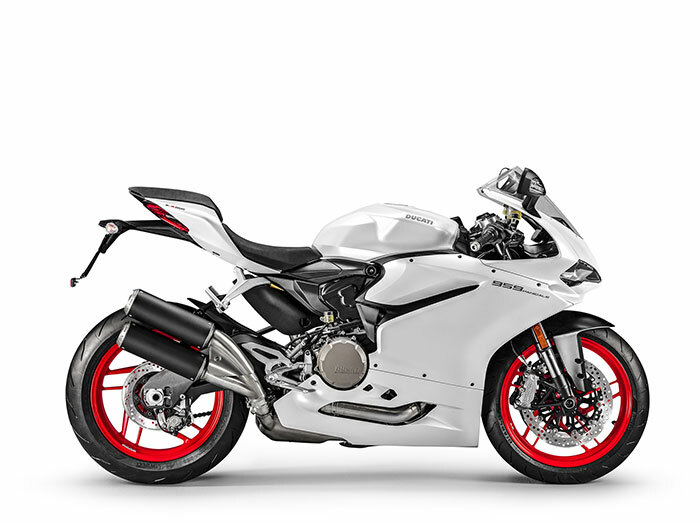 The 959 Panigale completes a range that already included the 1299 Panigale, the 1299 Panigale S and the Panigale R – all featuring the Superquadro engine as a stressed member of the chassis and a compact, die-cast aluminium monocoque. The 955 cm³ twin-cylinder Superquadro has a 100 x 60.8 mm bore x stroke, with a maximum power of 157 hp at 10,500 rpm while the maximum torque is 107.4 Nm at 9,000 rpm. The 90° L-twin Superquadro engine of the 959 Panigale is a further step forward from the previous version installed on the 899 Panigale. 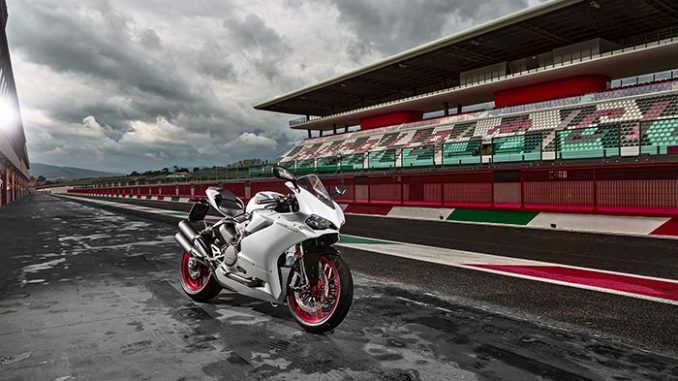 The 959 Panigale engine is also the first Superquadro to be in line with Euro 4* pollution control standards. With its 157 hp at 10,500 rpm, and a torque of 107.4 Nm at 9,000 rpm, this twin-cylinder power unit ensures user-friendlier, smooth delivery. The engine size increase was possible thanks to the longer piston stroke – increased from 57.2 to 60.8 mm, while the bore is still unchanged at 100 mm. To achieve the new stroke length, the crankshaft was redesigned to include a brand-new crank journal lubrication system – an absolute first for a Superquadro engine. The engineers went back to the drawing board for completely new con-rods, too – to suit the increased stroke, while the compression ratio has not changed from 12.5:1. The rethink also involved the piston crown and DLC (Diamond Like Carbon) coating on the piston pins. The two heads and aluminium top covers now feature a ribbed design to reduce mechanical noise – a critically important pre-requisite for Euro 4* compliance. For the same reason, a different cam timing chain was used. The crankcases, shared by the 959’s ‘bigger brother, the 1299 Panigale, are vacuum die-cast using Vacural® technology to ensure optimal weight saving, and feature consistent wall thickness and increased strength. The crankcase cover and clutch casing are both aluminium like the oil sump, and now sport a split design with differently ribbed patterns. The combustion chamber design allows for large valve diameters: 41.8 mm for the intake valve and 34 mm for the exhaust one. The valves are actuated by racing-derived rocker arms, ‘super-finished’ and with a special DLC facing for reduced friction and increased fatigue strength. The 959 Panigale volumetric efficiency is ensured by the oval throttle body dimensions – having an equivalent diameter of 62 mm. The throttle bodies are now fitted with two injectors per cylinder – one above and one below the butterfly, independently controlled by a full Ride-by-Wire system. The new engine uses Ducati’s secondary air system, maintaining performance-optimised fuel mapping and effectively containing HC and CO levels while preventing unburned fuel emissions. The transmission features a six-speed gearbox and a 1299 Panigale-derived oil bath clutch. An absolute first for a mid-size Superquadro engine, the clutch assembly features a progressive self-servo mechanism that compresses the friction plates when under drive from the engine without any extra effort required from the rider to release the clutch. While enhancing frictional efficiency, this also results in a rider-friendly, light clutch lever “feel” at the handlebar. In sport riding conditions, the same mechanism reduces pressure on the friction plates, enabling a true racing “slipper” action, reducing the destabilising effect of the rear-end and providing a much smoother feeling when closing the throttle or during aggressive down-shifting, with the extra benefit of a super-responsive lever. The 959 Panigale has a redesigned exhaust system with twin silencers placed on the right-hand side of the bike*. Could the 959 Panigale engine not feature Ducati’s very own Desmodromic timing system? Bearing in mind the high Superquadro engine speeds, it would be impossible for the intake and exhaust valve rocker-arms to follow the steep closure profile of the high-performance cam profiles using normal valve closure springs. With the Desmo system, the valves are closed mechanically with the same level of accuracy as in the opening stage, enabling the steep cam profiles and radical cam timings required to achieve this model’s signature high performance standards. This system is used on every single Ducati motorcycle and is constantly proven on Ducati Corse’s World Superbikes and Desmosedici MotoGP bikes. The 959 Panigale engine has been built to guarantee a considerably higher torque, for optimised delivery throughout the rev range. The increased torque and maximum power values do not imply shorter service intervals, therefore, valve clearance inspections are still only required every 24,000 kilometres (15,000 miles). General services are required every 12,000 km (7,500 miles) or 12 months. The electronics package available on the 959 Panigale includes ABS, Ducati Traction Control (DTC), Ducati Quick Shift (DQS), Engine Brake Control (EBC) and Ride-by-Wire (RbW). Thanks to Ducati Riding Mode technology, these systems can be combined differently to give the bike three different personalities. The 959 Panigale has 3 available Riding Modes: Race, Sport and Wet. The 959 Panigale standard equipment includes a Bosch ABS 9MP Brembo braking system with integrated pressure sensor. The 3-level system provides shorter stopping distances with enhanced stability in any riding condition by being fully integrated with the Riding Modes. While Level 1 of the system enables a sport-oriented ABS intervention with no rear lift-up prevention, Level 2 delivers the same intervention with rear lift-up prevention activated. Level-3 provides outstanding braking stability and rear lift-up prevention. The 959 Panigale DTC system uses the same software logic developed and used by Ducati Corse for their MotoGP and World Superbike motorcycles and offers a choice of eight settings developed to respond to any environmental condition. While Level 8 administers a confidence-building, high level of interaction from the system by activating upon the slightest detection of wheel-spin, Level 1 offers a much higher tolerance and reduced intervention for highly competent riders. The 959 Panigale DQS electronic quick shift allows gear changing to be performed virtually instantly. The DQS system, however, can be deactivated for traditional gearbox operation. The system consists of a micro-switch built into the linkage of the gear change lever, which, when actuated to select a higher gear, sends a signal to the main engine ECU. The ECU instantly detects which gear the motorcycle is in and then reads the amount of throttle opening before applying a pre-programmed cut in fuel injection and ignition measured in milliseconds. This split-second electronic interruption in drive is programmed precisely to allow the next gear to be selected without having to actuate the clutch or close the throttle. The new Superquadro engine additionally features a brand-new, MotoGP-derived gear sensor – designed to optimise the electronic shifting strategy while improving both performance and comfort. The EBC system has been developed by Ducati Corse to help riders optimise vehicle stability in corner entry conditions by equalising the positive, negative and retrograde torque forces applied to the rear tyre under severe engine-braking conditions. The EBC monitors the throttle position, selected gear and crankshaft de-acceleration rate under heavy braking and administers precise, full Ride-by-Wire throttle openings to balance the torque forces acting on the rear tyre. The EBC can be personalised according to 3 different levels. Each Riding Mode is pre-programmed to instantly change the bike’s personality by adjusting the ABS, DTC and EBC levels of intervention as well as the Power Modes – the different power output curves. The available modes are the result of the application of several, dedicated class-leading technologies. The Ride-by-Wire electronic throttle control system administers three different mappings to regulate power delivery – named Power Modes. The DTC system uses eight levels of system interaction to enhance control by reducing rear wheel spin and the triple stage Bosch 9MP control unit ensures maximum anti-lock efficiency. Finally, the EBC monitors crankshaft de-acceleration under heavy braking and administers Ride-by-Wire throttle opening to maintain optimum grip. By selecting the Race Riding Mode, the rider can use the “High” Power Mode – ensuring 157 hp power with highly responsive engine behaviour to throttle opening. The Race mode also reduces the DTC system degree of intervention, provides a race-oriented EBC and front-only ABS with no rear end lift-up prevention. By selecting the Sport Riding Mode, the system will select the “Med” Power Mode – ensuring 157 hp power with a smoother engine response to throttle opening. The Sport mode slightly increases the DTC system degree of intervention, and provides a sport-oriented EBC with front and rear ABS activation for increased rear end lift-up control. The Wet Riding Mode makes the “Low” Power Mode available for road or track use, with 100 hp power and an even smoother engine response to throttle opening. This corresponds to the maximum level of DTC intervention, with ECB in line with environmental conditions and a more “invasive” ABS setting in terms of anti-lock efficiency and rear end lift-up prevention. The 959 Panigale has a compact instrument panel with a data-rich, black-on-white LCD display and three different levels of back-lighting. The rev counter features prominently in the top part of the screen, along with instantaneous speed and selected Riding Mode with the corresponding EBC, DTC and ABS settings – modifiable from the special menu. The rider can navigate the menu using the provided left-hand switchgear buttons and also change the display of secondary information including fuel consumption, time, odometer and trip meter. When the 959 Panigale is stationary, the instrumentation is accessible as a control panel to personalise and save ABS, EBC, DTC, DQS, and Ride-by-Wire settings within each Riding Mode. Additionally, the stopwatch function, actuated manually by using the flasher button on the switchgear, can display the last 30 recorded lap times, each time also storing the lap number, maximum speed and maximum rpm achieved during that lap. The 959 Panigale can also be fitted with the optional plug-and-play accessory by Ducati Performance, the Ducati Data Analyser+ with GPS function (DDA+ GPS). 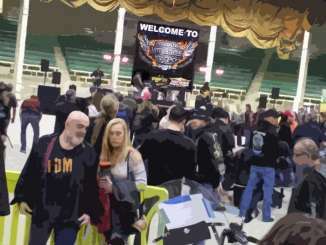 It consists of a software download, also available for Mac users, and a USB-ready data retrieval card which evaluates the performance of the bike and its rider by graphically presenting specific channels of information. The DDA+ GPS is a latest-generation DDA system with a GPS function that automatically records lap-times every time the 959 Panigale crosses a circuit start/finish line. As the rider crosses the start and finish line and presses the lights flasher button, the innovative system logs the coordinates of that position and then automatically logs each lap time – as the motorcycle completes subsequent laps. An essential piece of equipment for track use, the DDA+ records numerous channels of data including throttle opening, vehicle speed, engine rpm, gear selection, engine temperature, distance travelled, laps and lap times. A special channel is dedicated to recording the DTC index which can then be viewed as a graphic trace indicating the amount of DTC interaction during rear wheel-spin. At the end of a ride or track session, data can be downloaded to compare, analyse and get an inside view of the performance of the rider and motorcycle. Like its ‘bigger brother’, the 1299 Panigale, the 959 Panigale features the Superquadro engine as a stressed member of the chassis and a compact, enhanced-strength, die-cast aluminium monocoque. The monocoque attaches to the cylinder heads, protruding forward to house the steering head bearings contained in two aluminium bushes and forming the airbox along the way, which contains, in addition to the air filter, the throttle bodies and fuel circuit and injectors and is sealed off by the aluminium fuel tank bottom. The already outstanding chassis geometry of the 899 has been further improved in the 959. The unchanged front-end geometry includes 24° of rake and 96 mm of trail. 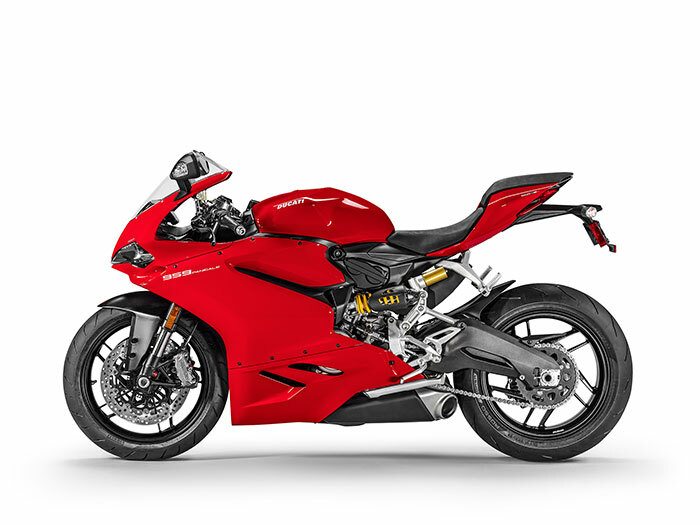 In the fully die-cast aluminium, twin-sided swingarm, the pivot is lower by 4 mm with respect to the 899, contributing to the 1,431 mm wheelbase, while weight distribution is 51% at the front and 49% at the rear. The 959 Panigale is equipped with 43 mm Showa BPF forks, fully adjustable in spring pre-load and compression and rebound damping. The titanium grey coloured fork bodies house chrome sliders with radial calliper mountings. The Showa Big Piston Fork (BPF) considerably improves damping control at low speed, ensuring lower-pressure oil feeding and reducing the amount of fluid required for compression and rebound adjustment. This results in improved suspension performance and significant weight saving with respect to traditional fork types. An adjustable steering damper completes the front-end package. The rear suspension unit includes a fully adjustable, side-mounted Sachs monoshock. This unique positioning ensures that the unit is totally accessible for rebound and compression damping and spring pre-load adjustment, and is designed to provide a progressive-rate linkage directly acting on the twin-sided swingarm. 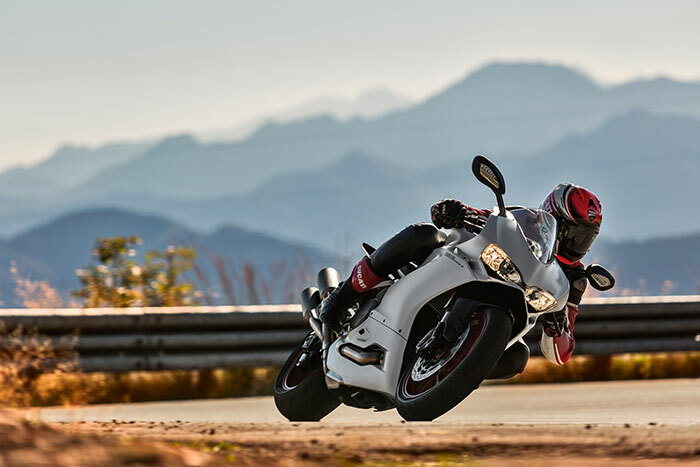 The 959 Panigale has a 10-spoke, 3.5 inch wheel at the front and 5.5 inch wheel at the rear, both rolling on Pirelli Diablo Rosso Corsa tyres: size 120/70 ZR17 at the front and a nimble 180/60 x ZR17 at the rear. Designed as high-performance equipment for road and track use, the Pirelli Diablo Rosso Corsa tyres are the ideal choice for the 959 Panigale, ensuring amazing grip when leaning into and speeding out of corners. Developed with World Superbike-derived Pirelli technology, the rear tyre uses a three-zone multiple compound to optimise the contact patch and achieve top road and track grip. The 959 Panigale front brakes use twin radially-mounted M4.32 Brembo monobloc callipers actuated by master cylinders. The front callipers grip 320mm discs, while a single 245mm disc at the rear is gripped by a single Brembo calliper.